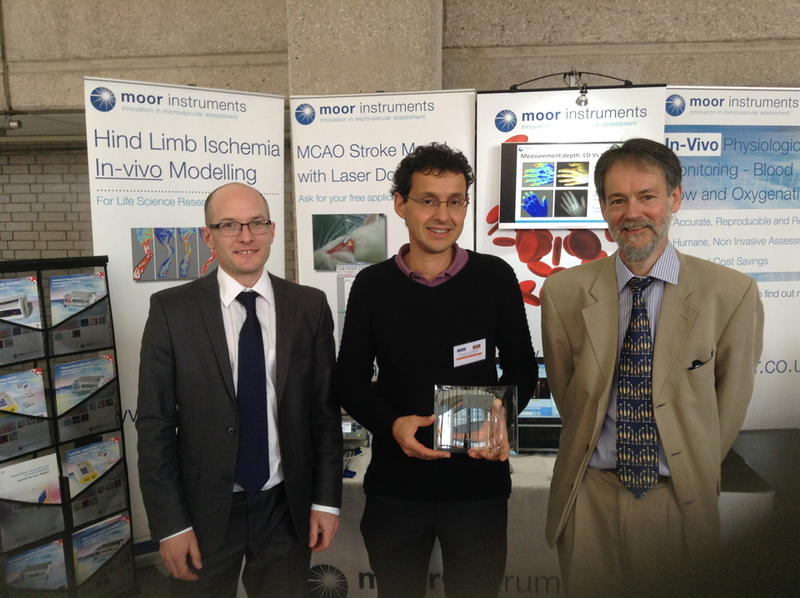 Moor Instruments were proud to support the British Microcirculation again this year in Manchester. We were pleased to see so many new and existing customers and show off our latest product range. Pictured here are Brian Lock and Rodney Gush, with sponsored speaker Jean-Luc Cracowski who gave a wide ranging presentation on ‘Assessment of human skin microcirculation function’ covering many devices, physiological provocations and interesting observations. Jean-Luc is holding the plaque presented earlier by BMS president, Prof Nicola Brown. Cynthia To gave an excellent presentation on the flap imaging study; a collaboration between UEMS, RD&E Hospital and Moor. It was good to see many other oral and poster presentations also benefitting from use of other Moor devices. A big thank you to the BMS, Andrea Murray and her team at Manchester for a very interesting, enjoyable, well attended and well-organised conference!